I still can remember the day I bought my first Havs. My sister and I got Floral ones. I still have it to this day and I still love wearing them! If you also love Havaianas and you got a kid/nephew/niece/cousin who's 5-12 years old, take them to the Mommy Mundo Bazaar this November 24-25 as Havaianas Design A Smile will a booth there! 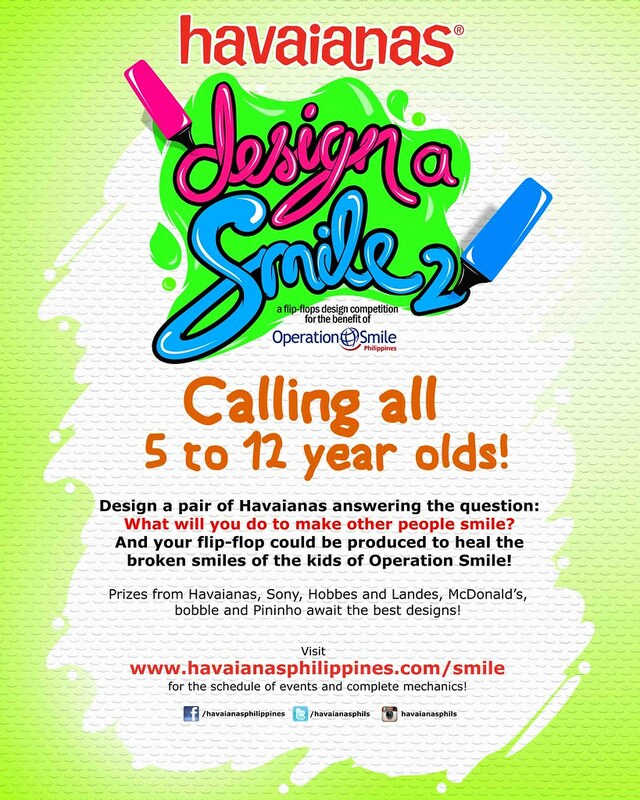 First launched in 2010, Havaianas Design a Smile gives children the chance to show their artistic talents by designing the next Havaianas Smile pair – a special design which will be produced into an actual Havaianas pair A percentage of the sales will be donated to Operation Smile Philippines, a non-profit organization which provides life-changing surgeries to children with cleft lips and cleft palates. The initial run generated more than 2,000 entries and raised more than PHP 100,000 from donations alone during this period. This is truly for an awesome cause! If you want to join, read on for the mechanics! 1 1. Contestants must attend any of the Design a Smile events to enter the contest. 2 2. Contestants must completely fill out the official entry form at the event location. The parent or guardian or present at that time must sign the consent section of the official entry form. 3. Contestants are highly encouraged to donate to Operation Smile. 100% of donations will be given to Operation Smile. The lack or amount of each contestant’s donation will in no way hinder their participation in the contest or influence the judging of their entry. 4 4. Contestants will be provided with scratch paper, art materials and their official entry form. Only one official entry form will be provided per contestant. 6. Contestants must provide a one sentence explanation of their design in the designated area in the official entry form. 7 7. Contestants may only use the art materials provided at the event. Contestants may only use five colors in their design. 8 8. Contestants will have thirty minutes to complete their entry. 9. Contestants may not bring in pre-existing designs. Contestants may not trace or copy other artwork. Contestants may not include trademarked or copyrighted icons in their design, such as known cartoon characters or other brand names. 1 10. Contestants must submit their official entry form to any official contest organizer after thirty minutes or they will be disqualified. 11. Contestants may only submit one (1) official entry. Should the contestant submit another entry, only their first entry will be considered valid. The contest organizers will use the control number on each official entry form to determine which form was submitted first. 12. Incomprehensible, illegible, incomplete and offensive entries may be rejected and deemed illegible at the sole discretion of the contest organizers. 13. The contest organizers reserve the right to verify the validity of entries and to disqualify any entrant who tampers with the entry process or who submits an entry that is not in accordance with these mechanics or submit copied or unoriginal designs at any time. 14. By entering this competition, contestants agree to allow the organizers to publish their entry and the design, along with the contestant’s name on Havaianas websites (official website, microsite, or social networking sites), on the official Havaianas Stride Guide newsletter, in Havaianas PR materials, or at Havaianas retailers nationwide. 15. By entering this competition, contestants agree to allow the organizers to utilize their design and any images and any other work generated which is included in the entry. Contestants agree to allow the promoters to distribute, communicate, broadcast, modify, edit, adapt, segment and otherwise use the drawings, diagrams, images and designs submitted in the official entry form. By entering the competition, contestants acknowledge that there is no payment or consideration payable by the organizers to use of the contestant’s drawings, diagrams, images and designs. 17. The ten (10) shortlisted entries a Smile will be posted online at http://www.havaianasphilippines.com/smile/ . Customers can vote for the designs starting February 11 up to to March 29, 2013. 18. Shortlisted finalists will be announced by April 2, 2013 at the campaign website. Winner will also be notified via their contact information (mobile, email and registered mail). 20. The entry with the highest score wins the contest. 21. Winners will be announced at Terry S.A. office (2293 Chino Roces Ave. Ext., formerly Pasong Tamo Ext., Makati City) on April 2, 2013 to be witnessed by a DTI representative. 22. The contest judges and all employees of Terry S.A. Inc. and its sub-distributors and retailers, Leo Burnett, GeiserMaclang Marketing Communications Inc., Creative Juice Communications Inc., and other promo partners/third party suppliers, including their relatives up to the third degree of consanguinity or affinity, are automatically disqualified from joining this contest. Persons reporting regularly to Terry S.A. Inc. and its sub-distributors and retailers, Leo Burnett, GeiserMaclang Marketing Communications Inc., Creative Juice Communications Inc. under a contract or service and who, by the nature of the service they render may have a direct and personal knowledge of the promotion shall also be disqualified. 23. The organizer’s decision relating to any aspect of the competition is final and binding on each person who enters with the concurrence of the DTI. No correspondence will be entered into. 24. Any costs associated with entering this competition and/or accessing the website are the contestant’s responsibility. 25. Winners shall have at least sixty (60) days from notification of winner, within which to claim their prizes from the Terry S.A. Head Office at 2293 Don Chino Roces Ave, Makati City. 26. Winners must bring their birth certificate and the two (2) valid IDs from the parent or guardian who signed their official entry form as evidence of his/her identity and entry. Provincial winners can claim their prizes at the nearest Havaianas store/outlet. 27. All unclaimed prizes after the said date shall be forfeited in favor of Terry S.A., Inc. with prior approval from DTI. 28. The organizers shall not be liable for any loss or damage whatsoever which is suffered (including but not limited to indirect or consequential loss) or for personal injury which is suffered or sustained, as a result of taking any of the prizes, except for any liability which cannot be excluded by law. 29. The 20% tax for prizes exceeding P10, 000.00 shall be shouldered by the winner. 30. Prizes are not convertible to cash. 31. By entering this competition, contestants agree to allow the organizers to utilize their design and any images and any other work generated which is included in the entry. Contestants agree to allow the promoters to distribute, communicate, broadcast, modify, edit, adapt, segment and otherwise use the drawings, top diagrams, images and designs submitted in the official entry form. By entering the competition, contestants acknowledge that there is no payment or consideration payable by the organizers to use of the contestant’s drawings, diagrams, images and designs. 32. Any costs associated with claiming the prizes are the contestant’s responsibility. 33. The entry with the highest total score will be featured as a limited edition print in a future Havaianas Collection, with a percentage of the sales going to Operation Smile. The design submitted by the winner may be altered or modified by the organizers for the purpose of creating a commercially acceptable design for the limited edition print. The contestant acknowledges that the limited edition print may feature part or all of the entrants design and the entrants design may be substantially modified to create the limited edition print.